More than 30 fired employees at Ellen’s Stardust Diner in Manhattan’s Times Square have been offered their jobs back, the result of a settlement forged after a messy union dispute caused a rift between staff and management. Trouble started for the diner’s singing employees last year after owner Ken Sturm hired new management to “streamline” the restaurant’s business, which in this case translated into canning workers for small offenses. This might not be so unusual elsewhere (unfortunately), but Ellen’s had a long-held reputation as a bastion for aspiring Broadway stars, and one of the perks of working there was a flexible schedule that accommodated staff as they auditioned, performed and otherwise continued to pursue their dreams. 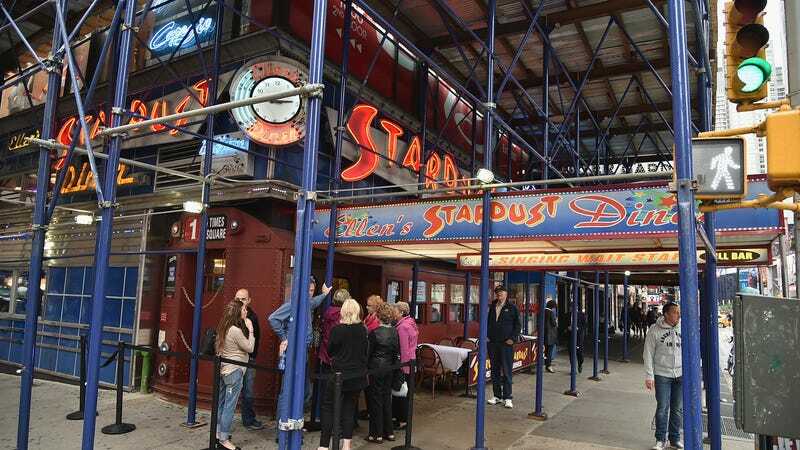 As a result of that effrontery, the workers announced last summer that they were unionizing, saying they had been “bullied, sexually harassed, and abused by our higher-ups.” Stardust management returned fire, filing a countersuit this summer accusing employees of swindling the restaurant out of more than $400,000 by overcharging for sodas and coffees. But days before the trial was to begin, a settlement was reached. Waiters who wanted their jobs back could have them, one of the terms of a settlement reached among workers, the restaurant and the board that also entitles all the fired workers to back pay dating to when they were fired. Of the 31 fired singers, 13 plan to return to Ellen’s, while the rest chose not to. The restaurant has not admitted to any wrongdoing, and the workers who return will have their disciplinary records at the restaurant expunged.